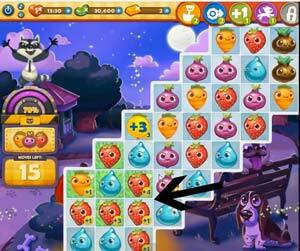 These Farm Heroes level 246 cheats and tips will help you beat level 246 of Farm Heroes. 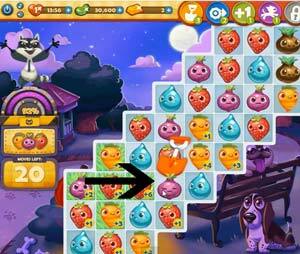 The objective of Farm Heroes level 246 is to defeat Rancid the Raccoon in 25 moves with onions, carrots, and strawberries. In this level you only have 25 moves to defeat Rancid. 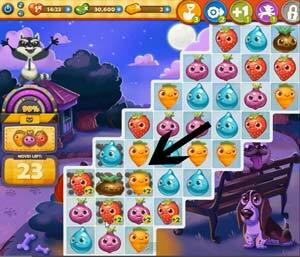 You need to collect carrots, onions, and strawberries to decrease his meter. To help you do this, you can turn the brown onions into grass. The grass will help the resources to increase their point value. If you make matches with the required resources that have a high point value, Rancid’s meter will decrease. When you make matches with the required resources, Rancids meter will decrease. Try to create large combinations in order to use your moves to their full potential. If you can, create combinations on the grass that you have made from the brown onions. Since this is an awkward shaped board, L shaped combinations can be very useful in this level. Use cascading moves to your advantage. If you are coming down to your last few moves, and still need to defeat Rancid, use a booster. The shovel can remove a resources that may be in the way of you making a combination. The dog can remove an entire resources from the board as well.